There is a palpable need within the nonprofit community for endowment guidance – a need that could best be met by an investment manager with a holistic focus on endowments. Over a decade ago, I chaired a startup endowment in Memphis and had trouble getting the help that we needed. Subsequently, we made a lot of mistakes, all preventable, which ultimately led to the endowment being spent down to fix a budget shortfall. But I didn’t realize how common our experience was until I learned in 2014 that the Memphis Symphony, with some of the savviest people in town on its board, had spent through its $6 million endowment – a move that, given the unique characteristics of endowment donors, poisons the well for future endowment gifts. As it turns out, endowment program failures are very common and they constrict the ability of nonprofits to build permanent funding. There are plenty of investment managers who can manage assets. There are plenty of fundraising consultants who can direct a campaign. But nobody properly addresses the whole endowment program, especially common concerns like structure, documentation, and nurturing donor confidence. After all, if an endowment is spent down, who cares that it was invested well? My mission is to build healthier, more stable nonprofit organizations by bringing comprehensive endowment training, guidance, and management to the market. There really is no existing handbook or curriculum that squarely addresses the need. So after extensive research, I created what became Endowment 101. It’s a comprehensive primer and planning process that starts with a question that rarely gets asked: What does success for an endowment program look like? For most, this leads to recognizing growth through new gifts as a primary goal, which, in turn, requires pursuing the right policies and culture to nurture donor confidence. 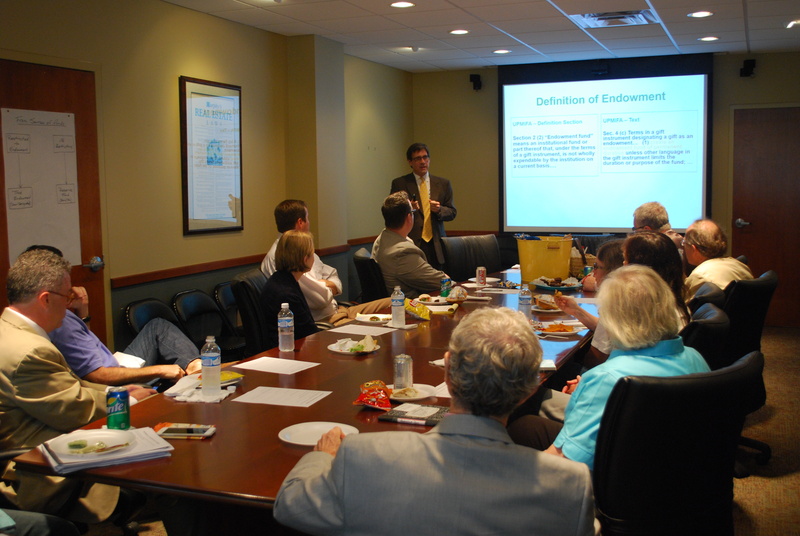 The Endowment 101 seminar successes validated market interest and yielded a wealth of insights into nonprofits’ needs through written evaluations and onsite follow up visits. I have no doubt that making them available to nonprofits regularly would attract plenty of qualified prospects for endowment assistance. Those same sessions could also serve as an orientation for new board members that would keep them on the same page through the inevitable turnover and institutional memory losses that plague the nonprofit world. 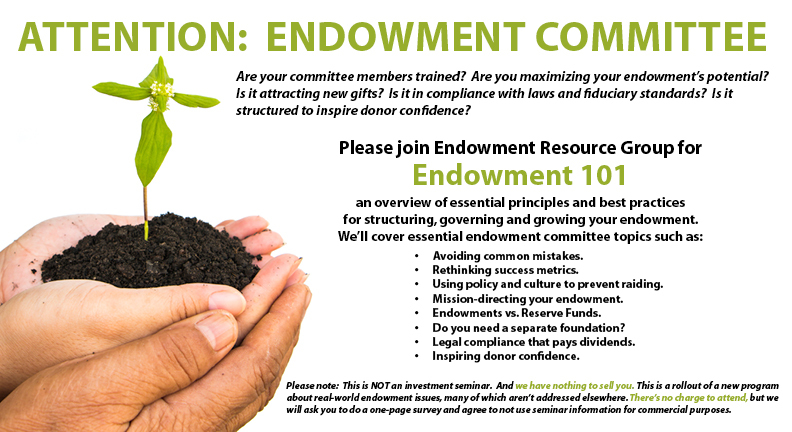 In essence, Endowment 101 provides a call to action: If you’re going to do it, do it right. It’s a tall order and more than most board members signed up for. But an endowment-focused partner could go beyond the training role to shoulder much of the burden and coach nonprofits toward their endowment objectives. Many of the services needed, such as those pertaining to disbursals and UPMIFA standards, overlap with investment management functions. This makes the holistic endowment specialty a natural fit for bundling with investment management. Besides, with fees based on assets under management and deducted automatically, the money managers command the most effective revenue model around. Bundling services like this is really nothing new. Many investment management firms have thoroughly integrated financial planning and implementation assistance into their practice and get paid through asset management fees alone. But there’s no equivalent model for endowments. Prospective endowment opportunities often go out to as many as ten firms; so right off the bat, there’s an imputed one-in-ten chance of winning the business. By contrast, when an individual prospect goes through the entire financial planning process with an integrated investment manager, the win rate for the assets is more like nine out of ten. I believe the same model will work for endowments and with similar results. Sure, not all nonprofits will want our services just as not all individuals want a new financial plan. But leading with training attracts people who qualify themselves as good client prospects by their participation. Some advisors say endowments are a waste of time because they’re fickle and political. But fickleness is a standard consumer response to products that lack differentiation. Similarly, awarding business to trusted friends is a comfort-seeking behavior seen whenever products are opaque and undifferentiated. And from where the client sits, most investment management firms just aren’t as differentiated as they may think. They all address the same thing: investments. By my measure, that’s only the fourth largest concern that organizations have about their endowments. So I see a ready market appetite for an investment firm that can address all their concerns. Doing that would redefine the market so thoroughly that competitors wouldn’t even look like they’re in the same business. I believe that, with the right execution, this business could be a category killer – a business that owns its space so thoroughly that other firms don’t even bother competing (and may even refer clients). I am looking for an experienced partner who can manage assets and support the proposing and closing of new business. Preferably, it would be someone who is already tooled up with a solid platform and committed to fiduciary leadership. The ideal partner would also be capable of seeing and seizing an opportunity with national potential. The business could be incubated locally at a low cost to prove out and refine the business model before scaling up. This model holds the promise of replacing the usual constraints to asset growth with a process that could be scaled at costs that diminish with firm growth. I believe it could be grown into a sizeable national asset manager with very sticky assets that would command the highest multiples in valuation. All posts having to do with the Endowment 101 seminar series have been deleted leaving just the three articles below. Healthy endowments aim to grow through new gifts. One of the challenges of attracting those gifts is that your prospective donors, like many people, may not think of endowments as truly perpetual things but more like reserve funds that could be tapped in an emergency. The thought that one’s life savings could be frittered away plugging budget shortfalls isn’t very appealing. Donors prefer to make a lasting difference. One of the easiest ways to inspire donor confidence is by including the word perpetual in your fund’s name. “Perpetual Endowment Fund,” on a handout for example, makes the right first impression and answers an important question before it’s even asked. It will also help those in governance roles remember to be good stewards. It’s just harder to spend down a fund carrying the label perpetual. So make sure it’s always used, even when the fund is only referenced as a single line item on a report. And don’t let your Treasurer shorten it. Even if a fund carries a donor-imposed restriction for use as endowment, perpetual is still useful as a constant reminder of the legal and fiduciary obligations to preserve its spending power. Those obligations are spelled out by UPMIFA, the Uniform Prudent Management of Institutional Funds Act(s) which have been adopted in 49 US states (see upmifa.org for details). If there are any perceived ambiguities about the intent of a donor, the inclusion of perpetual in the gift instrument could eliminate them. Now some may see this as a disadvantage because it could restrict the organization’s flexibility in using the funds. But if that’s a concern, you may be better off calling your fund a reserve fund or, better, splitting off enough into a reserve fund that the remaining endowment fund can be embraced and promoted as a perpetual affair, honestly and with no hesitation. Healthy endowments need to be affirmed by all stakeholders without reservation. Annual meetings offer an easy opportunity to promote your endowment fund to members. Why just give a bare bones report when you could use your timeslot to increase visibility and ownership while planting seeds that could grow into gifts? “The Christ Church Perpetual Endowment Fund, which has a current value of $647,000, was established by the Board with money that Mrs. Porter left us in her will. Now I never met Mrs. Porter but I’m told she always sat right over there so she could hear the choir. And she wanted to make a lasting difference by leaving money she’d accumulated over her lifetime to the church to create an endowment to help pay for our music program year after year after year. Forever. “And to make sure that happens, we only spend a small portion each year so that it will be around forever. And we manage it very conservatively in accordance with state law and following policies adopted by the board. Which are all in this book I’m holding up, which is available for viewing by any member in the church office at any time. You shouldn’t even have to ask for it – it’s supposed to stay in the bookshelf right there when you come in the door. And you should find a recent statement in the back too. “Friends, this is your endowment fund just like this building is yours. They were both provided for us by those who came before us but it’s up to us to nurture and grow them to provide for future ministries. “That’s what Mrs. Porter did. She’s not with us but she’s still helping pay for the music we get to hear. This year, the earnings on her gift provided a little over $25,000 for our music program. Isn’t that a great thing to be remembered for? That’s her legacy. If you would like to create your own legacy, please consider the Christ Church Perpetual Endowment fund and see me or the Planned Giving Chair. Note that the appeal is based upon legacy, ownership, duty, and then legacy again. Among the barriers to endowment health, the most pervasive at organizations without professional development staff is the use of an insider as an investment adviser. These arrangements usually arise as a reasonable response to the perception that either the group lacks the skills to comfortably hire and supervise an outside advisor or the amount to be invested isn’t enough to support a more professional arrangement. Down the road, the organization can find itself stuck in an awkward position because nobody wants to risk offending the advisor by asking tough questions, much less by replacing him or her. The best way to avoid getting stuck like this is to never get into such an arrangement to begin with. Instead, the insider should be asked to be on the endowment committee where, unencumbered by the conflict of self-dealing, he will be able to provide unbiased advice. No professional advisor should be surprised to be asked to avoid a conflict as he already has to comply with similar professional standards on a daily basis just to maintain his licenses. What is professionally awkward, however, is serving on an endowment committee where an insider is the advisor or worse, sits alongside you on the committee! No surprise, conflicts of interest are also generally viewed as imprudent and violative of the fiduciary standards to which non-profit decision makers are held. That means conflicts could be illegal under UPMIFA, the Uniform Prudent Management of Institutional Funds Act(s) which have been adopted in 49 US states (see upmifa.org for details). It states that in selecting and working with an investment advisor, an institution shall act “with the care that an ordinarily prudent person in like position would exercise under similar circumstances.” Some states, such as New York, go further and specifically require institutions to consider an agent’s “independence including any conflicts of interest.” So check the provisions in your own state. Of course, if you have to check which state you live in to see if you’re breaking the law, isn’t that itself a sign that you’re falling short of the fiduciary standard of ordinary prudence? An even better reason to avoid such arrangements is that endowments managed by insiders typically don’t grow. Endowments need to engender ownership by all stakeholders in order to attract buy-in and grow. Nothing undermines ownership more than having an endowment associated with a single insider who is being paid. If your endowment is known as “the thing that Joe runs,” you’ve lost the battle. Resolve now to eliminate conflicts of interest. No large, professionally managed university or foundation would settle for less so why should you? NOTICE: The preceding is not legal advice but rather food for thought. As suggested, you should seek professional legal advice if you have any questions about conflicts of interest.